"I would like to say what a great job U.S. Immigration Legal Advisors did securing our K-1 Visa"
I would like to say what a great job U.S. Immigration Legal Advisors and staff did securing our K-1 Visa. They took to all of the places she had to go and stayed with her during the whole process. It was wonderful for me to know she was in great hands when I couldn’t be there with her. I would recommend this firm to anyone thinking of getting a fiancee visa. I am deeply grateful for all the work they did for us. 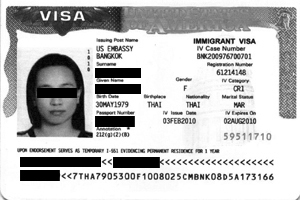 "Thank you sooooo much for a great job"
"I see the benefits of having used an attorney that would be able to communicate easier with my fiancee and the embassy"
"I have no hesitation whatever in recommending U.S. Immigration Legal Advisors to any potential clients who wishes to obtain a visa for their partner"